Does what it says. If a game is already running and hasn't finished yet i.e. neither won nor lost, you will be asked if you want to resign the current game and immediatly start a new one or not. Opens a dialog to start a certain game by number input. Counts that game as given in and ends the current game. Reveals the by then hidden color combination. 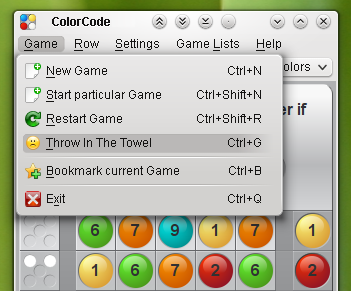 In the bookmarks list you can see the game properties and you or others can replay the game easily. Click here to end the application. Same effect as clicking the window's close button. Click here to get the currently active row filled with pegs of random colors. It's sometimes in the beginning of a game a convenient choice. Fills the currently active row with pegs of the same color as the pegs in the previous row. This option is disabled when the current row is the first one - of course :-). In the latter phases of a game where you only want to change one peg or the like, this can speed up the game. Removes any peg in the currently active row, so you can freshly start up again to compose your guess. If you have no clue, what the combination could be, or you are puzzled by seemingly contradictory hints click here and your computer will take over and makes his guess instead of you. Ctrl+H is definitely a keyboard shortcut you should memorize. Select from the two different game modes. In the first mode you have to guess the computers combination. In the second mode the computer will try to break a code you have composed. Clicking those options hides the related GUI control. This helps to reduce the desktop space the game window needs. Primarily usefull for small screens or when you want to scale down the game board as much as possible. Note that you should at least memorize the CTRL+M keyboard shortcut (the KDE's default for toggling the menubar) to reveal the menubar again if needed. If this option is checked, an indicator (numbers or letters) for each peg is displayed. This can be of help if you have difficulties to distinguish the colors as well as for all the more text aimed ones of us too ;-) In addition, this can be helpful to resemble other mostly terminal based games, making it easier to compare. You can select letter or number indicators in the Preferences dialog. Here you'll find predefined combinations of the three different level related settings, the number of colors, the number of slots (columns) and the possibility of pegs of the same color in one row. For each of those level related settings you'll find a separate control at the toolbar, so you can finetune the desired game settings there. If you change any of those settings while a game is currently running, you will be asked if you want to resign the current game and immediatly start a new one or not. If not, the settings will be applied to the next game after the current game has ended. If this option is checked, the hidden combination may contain one or more (even all would be possible) pegs of the same color. That makes a game a bit more difficult. If unchecked, all pegs in the hidden combinations are of a differnt color. Of course, if the chosen column count is higher then the chosen color count, this option is forced to be checked and will be disabled for this game. Launch the Preferences dialog window. Some settings are not available as menu options. Within this dialog window you can adjust all available game settings. See the description of the Preferences dialog below. Many options are described already in the Game Settings section above. So only the additinal options are mentioned here. Also all options within this dialog will raise tool tips with descriptions. Select Select the kind of indicators to show inside the pegs. You can also hide the different peg colors, so all pegs are displayed in the same gray. This option is only available, if you have the Show Indicators option enabled. Set a delay time in milliseconds between the computer's guesses. 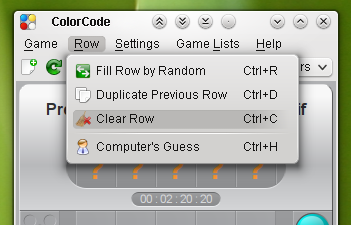 This setting only affects Computer vs. Human games when the Set Hints automatically option is enabled. Select of 3 different strength levels. This setting defines which solver algorithm will be used. It only affects the strength of your opponent in Computer vs. Human games. For the «Computer's Guess» in Human vs. Computer games always the highest level will be used. Revert all settings to their default values. Those settings are also applied when you start the game for the first time. Any changes to the settings, in this dialog or in the menus and toolbar, will be saved. So when you start a game the next time your last settings will be applied. The most often used Actions from the several menus are also accessible from the toolbar. In addition some settings like the numbers of columns and colors are available here. 6 Select the number of slots (columns). Available numbers range from 2 until 5. If a game is already running and hasn't finished yet i.e. neither won nor lost, you will be asked if you want to resign the current game and immediatly start a new one or not. 7 Select the number of different colors. Available numbers range from 2 until 10. Again, if a game is already running, you will be asked how to proceed. 8 Rate it for me. Click this button, to rate a computer's guess and get the hints fields filled in correctly. In Computer vs. Human games, this button replaces the «Computers Guess» button available in Human vs. Computer games. 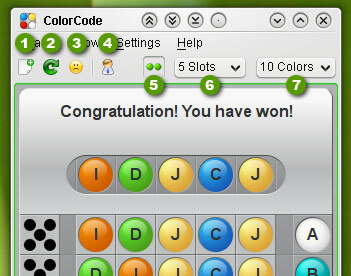 ColorCode is an advanced computer-variant of the commonly known MasterMind code-breaking board game. In it's modern form with pegs it was invented in 1970 by Mordecai Meirowitz. You can found it's rules, a brief history and some explanations about this game, solver algorithms and strategies here. If you are interested in some more information about MasterMind solver algorithms please have a look at the Links section. except for the files referred to in the links section, are licensed under the GPL v3.